Smartwatches are not just for adults. But does your child really need one? Today’s little ones are growing up surrounded by computers, tablets and Youtube. Technology has always been a part of their life – quite different from just a couple of decades ago. Some parents want to encourage their child to be more active so opt for a device that tracks fitness. Others want to know their children are safe, so opt for a wearable that allows them to stay in touch and tracks their kids location in real-time. We are not exactly spoiled for choice when it comes to smartwatches for kids so its important to do some research before deciding on a purchase. Here’s our selection of devices that are worth considering. The Kidizoom DX2 is the new and improved version of the company’s original watch. Now better than ever, this is one of the most popular devices for kids on Amazon. It lets young ones take pictures, videos, play games, tell time and more. The previous generation DX allows kids to take pictures and videos via a 0.3 megapixel camera. There is a voice recorder that lets your little ones change their voice and give it cool effects, a pedometer, and games which can be played via the touch screen. The new device brings all of this and more. With a new sleek and stylish design the DX2 includes 55 digital and analog customizable watch faces. It features two cameras that allow children to capture everything from action videos to selfies and allows them to customize them into watch faces via the accompanying smartphone app. There is also an assortment of new games. The watch helps teach kids how to tell time by letting them choose between a number of 3D digital and analog displays. In addition to the alarm, timer and stopwatch, there is a calendar feature and calculator so your child can work out simple addition, subtraction, multiplication and division problems. The kid-friendly GizmoPal provides easy, reliable ways to keep track of your children, and offers simple two-way calling so you can stay in touch at all times. The durable form factor uses safe and sturdy materials for your child’s active lifestyle. The thing is IPX3 water resistant rated for everyday use (e.g.,hand washing). At any time parents can open the smartphone apps and view their child’s location. You can also receive alerts of their location at pre-set times. Furthermore, after setting boundaries the watch will send notifications if it detects the child crossing them. This is great if they’re outside playing, or if someone is home watching them. GizmoPal works as a phone, too. Your child can make calls to two caregivers and receive calls from up to four preregistered numbers. For added safety, the phone auto-answers calls after 10 seconds. For parents who want something to track teens, options are fairly slim. This is where the Caref GPS Phone watch steps in – a GPS enabled watch that allows parents to track the location of their teens. Kids can call three numbers right from the phone. Mom and Dad can set up safe numbers on their app so the watch only accepts calls and texts from people who Mom and Dad choose. Caref GPS features geofencing so you can be notified if the child leaves a designated area and 3 hour location breadcrumbs so you can see where they have been in case of emergency. If your child ever needs help, he/she simply presses the SOS button and it will place a call to three preset numbers (in order). A push notification alert is also sent to those three numbers as well as an email alert. The latest addition to this list, the TickTalk 3 is the third generation of the kid’s wrist phone with locator. This touch-screen device tries to cover all the bases. It combines 2-way video calling (in 800×480 dpi resolution), voice calling, Wi-Fi calling, smart messaging, and location-tracking capabilities into one simple device. 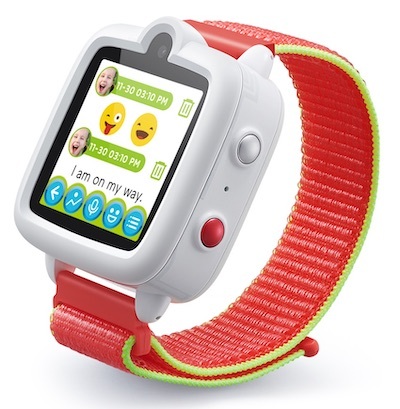 The company says this is the first and only kids’ watch phone that can make video calls smoothly in the US. Because of the newly added 4G reception, the TickTalk 3 is 50% faster than the previous model at providing the accurate location of your child. It also, allows parents to locate multiple devices on the same map. In essence, the watch works like a standalone cellphone. TickTalk is offering a $10 prepaid monthly plan with RedPocketor, but you can add a new line to your own GSM carrier, such as AT&T, T-Mobile, Metro PCS, and Cricket. This vibrant smart wearable, is the first in its class to be powered by Android 5.1 Lollipop. You’ve got a 3G smartwatch onboard, a GPS, pedometer and a SOS button in case of emergency. There’s a mic and speaker for hands-free calls, and because the watch has 3G, kids don’t need to carry a phone with them in order for it to work. The tracker has a polycarbonate case, uses removable standard straps, features a 1.54-inch color capacitive touch screen display, 3G SIM card slot, microphone, and a loudspeaker. It also includes preinstalled apps for kids such as games, calculator, stopwatch, and more. And there is a step counter to ease the little one into the world of fitness tracking. Great examples of gps watches for kids. We bought one our self for our kids from the brand Wherecom. We would definitely buy the next gen after our experience with the Wherecom Kidfit. We use it for our kids when they go outside to play or when they go to school. Because of the phone option it comes in handy when we need to call them. Half of the products aren’t available in the UK. any info on the doki watch? “Late 2016” delivery according to their website. Yeah I was interested in the Doki smart watch, but saw that the watch went up from the $99 (2016) to $219 (2018)! It’s not worth that much. I wish this article would have done comparisons to see which is the best watch overall. As a parent I mainly want a GPS tracker/SOS and calls/texts, but it would be a plus for her to have camera and of course the fun games! Any recommendations?? I’m pretty sure the Doki watch is only $199,not $219. I got it for my son and i love it! Its the only one that i could find that has video calling, he can also take photos on it and I can set zones so I know when he enters or exits these zones. Why not the Mykronoz zeround smartwatch?